Inland barges comprise the majority of barges operating on the United States waterways. These barges are designed to operate on rivers, canals, sounds, bays, and inland lakes. Inland barges provide the most economical mode of transportation for many high-density, large volume or oversized cargos. Different barge sizes and configurations assist in project execution and the transportation of specific materials. Barges are an integral part of the development of the many industries and communities that depend on the waterways. McDonough Marine Service has a large and varied fleet of flat deck barges available for charter. These barges are designed to carry cargo on deck and differ in size and structural design, depending on their intended use. Drop Spud Barges can be specially built to support a working crane. This type of barge typically has a boxed stern that provides maximum flotation while operating a crane. Extra strengthening is generally provided under the crane working area by use of additional bulkheads, internal trusses, or deck frames. 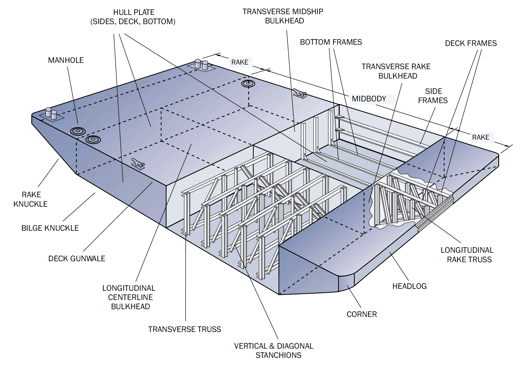 Hopper barges are usually of double-hull construction, wherein the sides and bottom of the cargo hold are separated from the hull by void spaces. These barges are designed for efficient transport of commodities in bulk, such as grain, coal, sugar, ore, steel, aggregates, timber products and numerous other cargos. McDonough Marine Service has various barges designated for use in nonhazardous oilfield waste service. These are deck barges with cargo bins and open hopper type barges, both having stabilizing bulkheads in the cargo compartment. McDonough Marine Service offers U.S. Coast Guard designed and approved “Liquid Mud Barges” that specialize in the transportation of nonhazardous oilfield drilling fluids, as well as other non-hazardous fluids. These barges are equipped with two deck-level bin tanks that provide a total of four separate compartments.